I hope you had a wonderful weekend. My sore throat was unfortunately not all that pleasant. Because of the amount of snow outside I was stuck at home. 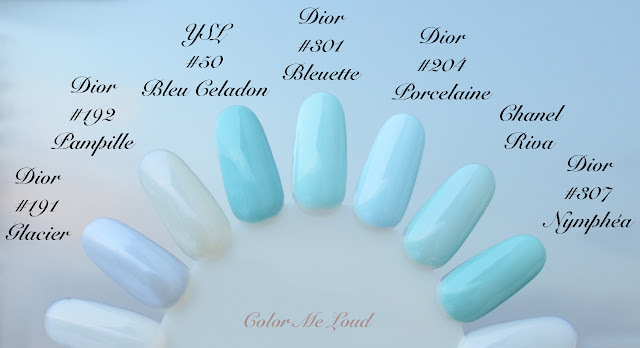 At some point I was so bored, I decided to swatch Dior nail polishes from Spring Collection for you. This turned out to be a harder job than I expected since I had to walk in snow, trying to catch some light. I hope it is helpful. From Dior Spring 2016 Collection, I also picked up one of the cream eyeshadow sticks (Twig) and the pink highlighter. I passed on the eye shadows palettes. If I feel better to check these in person soon, I might pick up one. During Holiday Season, I promised myself not to purchase any Dior Quint without swatching. I have to admit though the one I picked up after swatching was not all that exciting on the eyes either so maybe I should stay away from these. Have you picked up any? Would you recommend? I would like to start with that icy blue which made my heart skip a beat after the promo photos were published. Dior Vernis #301 Bleuette is a baby blue with a touch of aqua green which makes it easier to pull off for warmer skin tones. It goes a little streaky in the first two coats but on the third coat, it evens out nicely. Below I am wearing three coats. It dries very quickly. Bleuette is a plain cream. I am wearing it at the moment so I can edit later this week to report on how long it lasts. I really love light blues, especially in Spring and Summer. 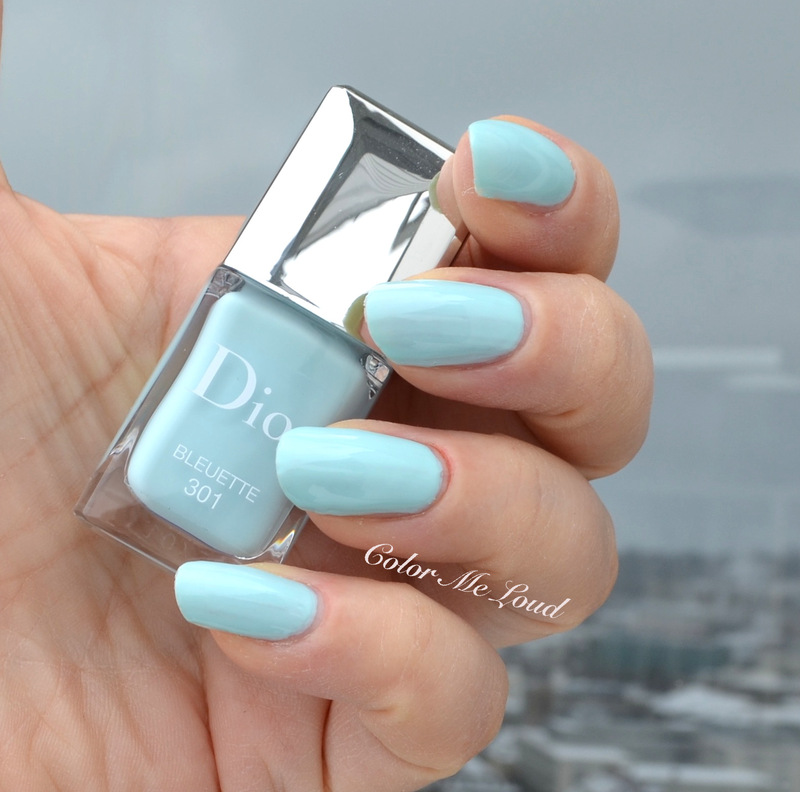 Dior Vernis #301 Bleuette is one of the most stunning light blues I have i my stash. It is not as cool as Dior #204 Porcelaine, not as deep as YSL #50 Bleu Celadon. Bleuette is the closest shade I have to Chanel Riva but I like it even more because it is less streaky and less transparent. The blue hidden shimmer of Riva is still very gorgeous though *winks*. Dior #307 Nymphaéa (I believe an Asian Exclusive from some years ago) is a tad deeper, Dior #191 Glacier is cooler, Dior #192 Pampille is much more transparent. .... it is very close to Deborah Lippmann's Spring Buds. I once used to like Deborah Lippmann but later on I found them to be overpriced in Germany. These are even more expensive than Chanel nail polishes and they often get phase seperation so I stopped collecting them. But two years ago when Spring Buds came out, I couldn't resist the uniqueness of this shade so ended up ordering it. Below you can see that DL Spring Buds is just a little greener than Dior #302 Garden. 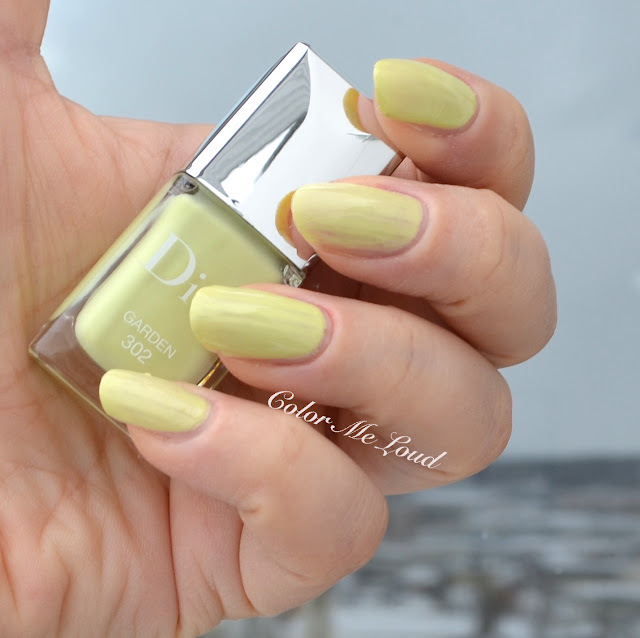 Dior #319 Sunwashed from 2015 Summer Collection( reviewed here) is more yellow. 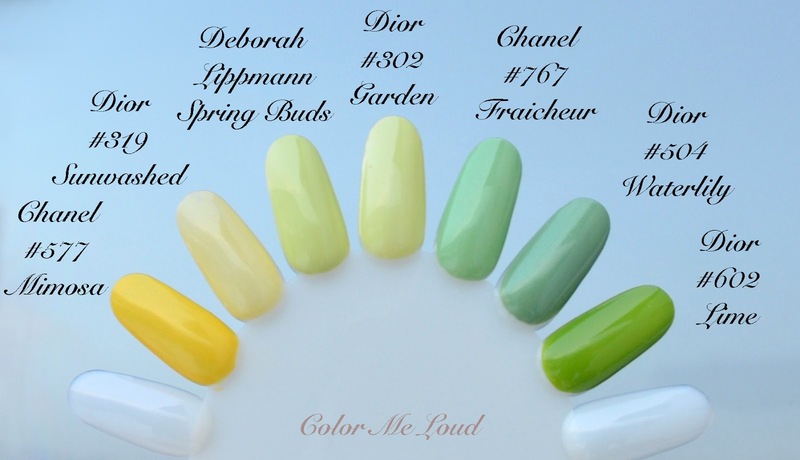 Chanel #577 Mimosa is also more yellow, Dior #504 Waterlily is deeper and more green. Chanel #767 Fraicheur (reviewed here) is one of the most greener yellows in my stash but is considerably more green next to Garden. Dior #602 Lime is deeper. Now onto my kind of shade. I love lilac on tips and toes alike. 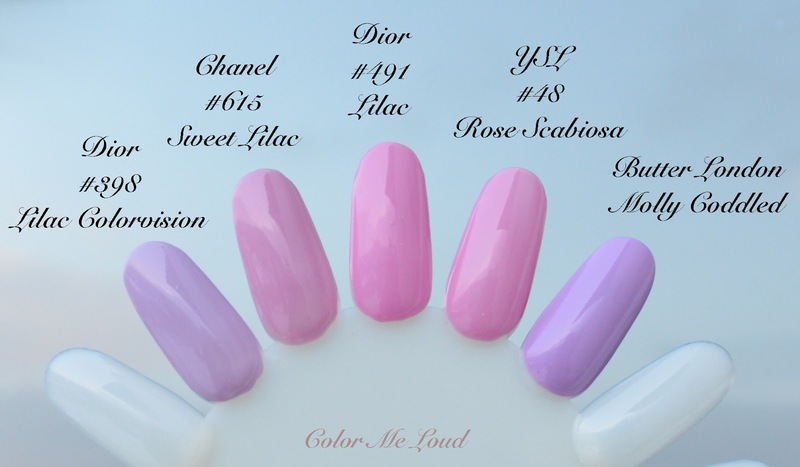 Dior #491 Lilac is a mid-toned pink lilac with cream finish. This one applied beautifully, no streakiness. It was self leveling and opaque in two coats. I am wearing two coats below. #491 Lilac is the most vivid lilac I own in my stash, it has a brightness to it which makes it unique. Dior #491 Lilac reminded me of two of my all time favorite shades, Chanel #615 Sweet Lilac (reviewed here) which is less bright and a tad cooler and YSL #48 Rose Scabies (reviewed here) which is just a little lighter. How fun to know that I have back up of both of these shades but I don't think I will get a back up of Lilac. I think Chanel #615 Sweet Lilac is my all time favorite shade in this color family. I also included Dior #398 Lilac Colorvision and Butter London Molly Coddled for you reference. These are more considerably cooler, leaning more purple. 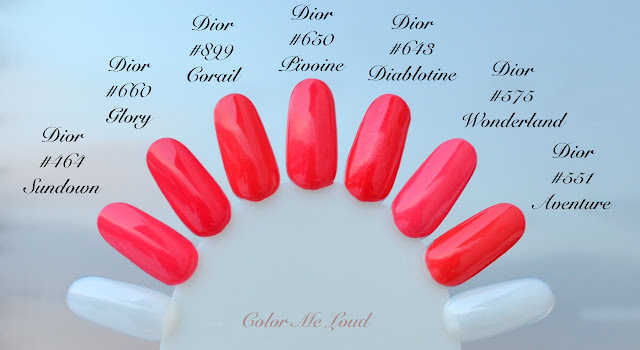 The last shade, Dior Vernis #650 Pivoine (peony in french) is the only shade in this collection with shimmer particles. It reminded me of Dior Diablotine but the shimmer particles in this one is finer and less apparent. 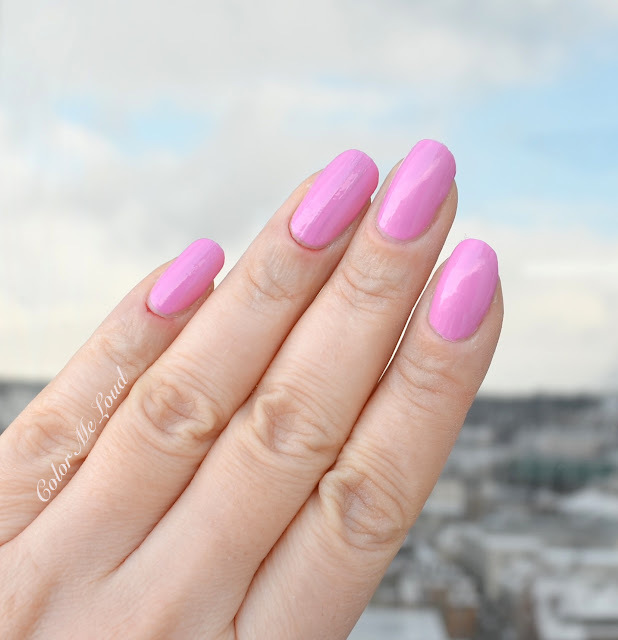 Pivoine has a jelly like finish and a transparency to it but with two coats it is opaque. It is really very beautiful under low light once the shimmer twinkles. Unfortunately it is very hard to catch sun rays at the moment so I couldn't capture the shimmer. The finish of #650 Pivoine is very unique but the base shade isn't something you (probably) don't own. 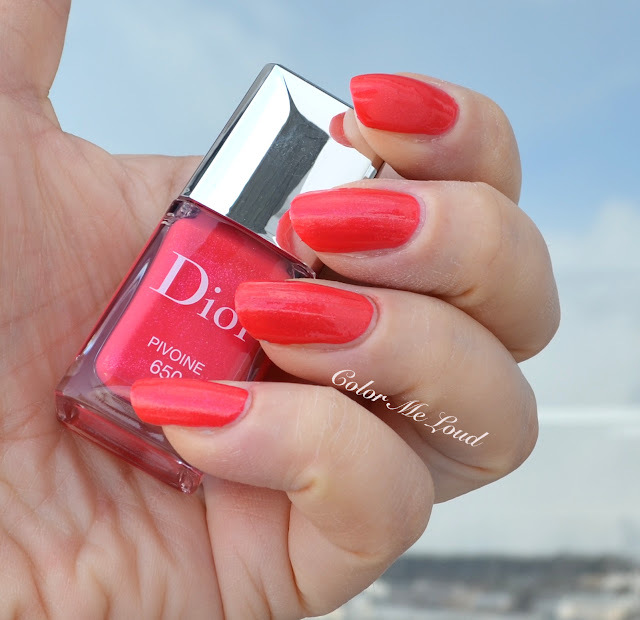 Dior #464 Sundown is a tab pinkies and lighter, Dior #660 Glory is a little redder. 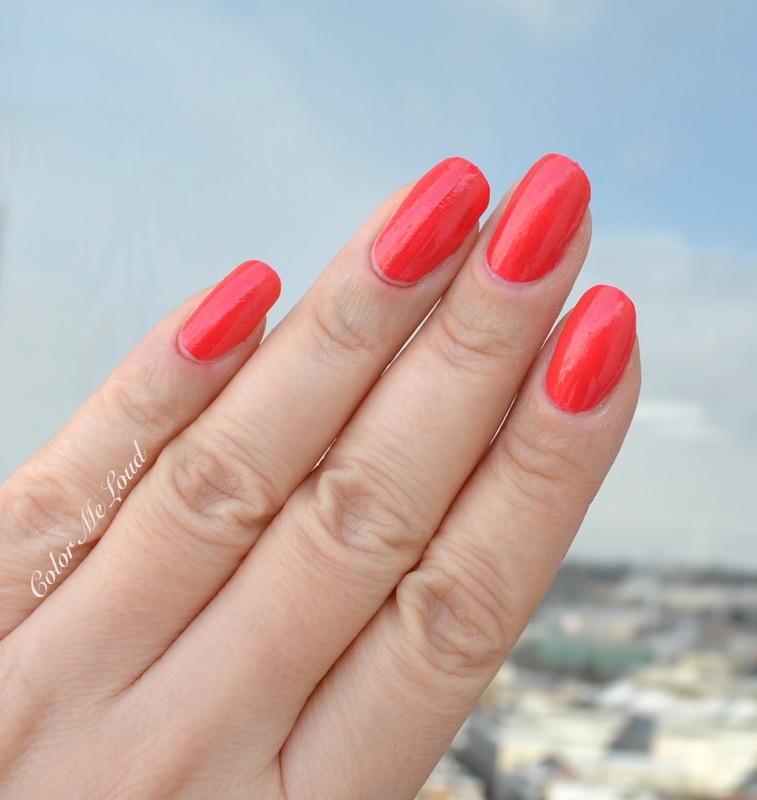 Dior #899 Corail (reviewed here) is a little warmer. Dior #643 Diablotine is more shimmery but very close. If you need this one, you need to get Pivoine. 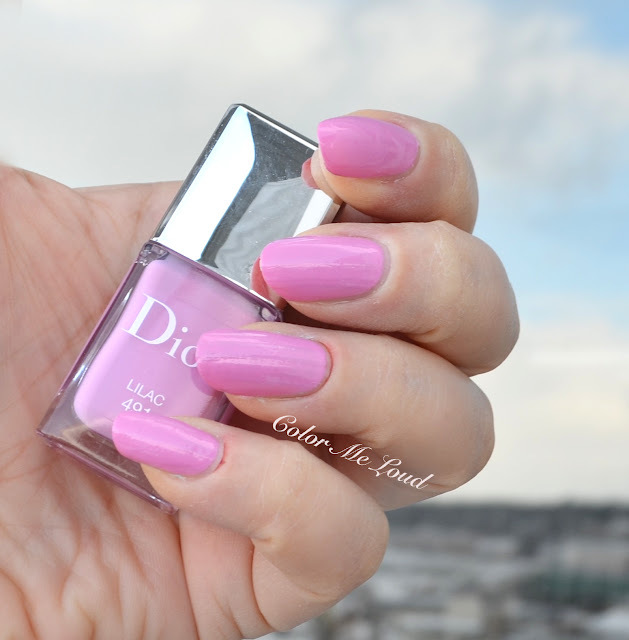 Dior #575 Wonderland (reviewed here) is more pink and lighter. Dior #551 Aventure is redder. 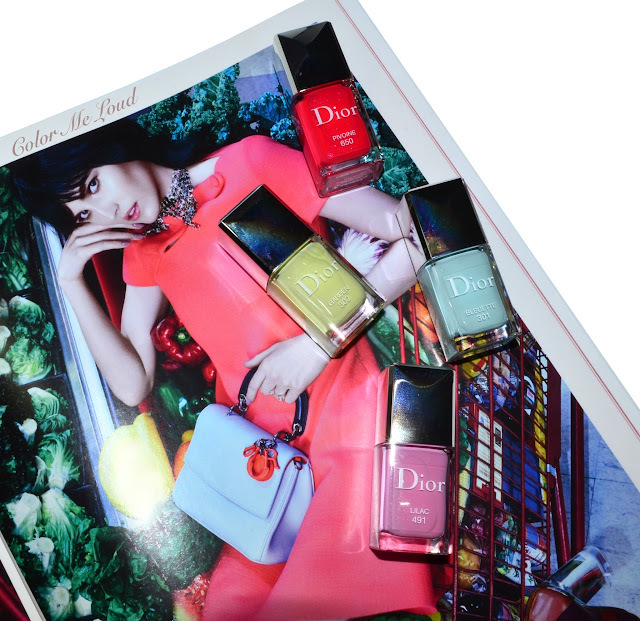 Final thoughts: I am loving the pastel take on to Spring on the nails by Dior. It is hard for me to pick one or two as favorite but probably if I had to, then I would go for Bleuette and Garden since these are shades which aren't released very frequently. Bleuette and Garden need three coats to overcome streakiness but the results are so stunning, I don't care. If you missed Diablotine some years ago, I recommend you get Pivoine as well. Which one is your favorite? Do you like pastel shades on the nails? Hi Sara, thank you for your reviews, beautiful swatches and comparisons. I think my favourites are Bluette and Lilac. I am little put off that Bluette needs three coats but the shade is unique so I'll probably go for it anyway. I like pastel shades for spring. Looking forward to hearing your thoughts on Twig. Hope you feel better soon. Hi Susan, can I ask which eye duo pencil you would recommend? Thanks. Thank you. I've just watched it. It's very helpful. I did like both of the eye duo pencils and of course the highlighter. Bleuette is really nice, it dries so fast so three coats are fine with me. I will check out Twig and let you know asap. Oh Rabbit Hole, love the name. I have to check this shade out but I didn't have much luck with Koh before, they don't last well on me. Lilac is really so pretty. It is a bit more vivid than the ones I have until now so it is unique. I love me a pastel blue on the nails as well. I have even a back up of Saint Tropez, one of my all time favorite summer shades. I picked up the blush, the pink highlighter and the shadow/liner duo in Twig. I swatched the palettes, but honestly, for the price, I don't think they're worth it unless you're really into the colour combo of Rose Garden (the green one) OR you're a die-hard Dior collector *wink*:-). I found that several colours in Blue Garden seemed to look nearly identical (kind of icy/white-ish with a hint of colour) once swatched, so they would probably just blend into each other one the eye. These are very pretty spring colors. With all the polish I have, I really shouldn't be contemplating buying any more. Still, I've been looking for Pivoine everywhere. The only two colors that seem to be available near me are Bleuette and Lilac. I need to go through my stash and see if I still have Diablotine. I actually located three or four near dupes of this "peridot" pastel. Will take a photo to show you. I am especially vigilant about not buying more polishes if I am able to restrain myself-- so stash shopping, sometimes, though not always helps. I already have Sweet Lilac which I love so you sold me on picking Bluette! It looks amazing on you! I think is the most unique from the four! I'm eyeing on the pencil eyeshadow duos especially Iris but I will wait to swatch them in person to decide! I already got from Selfridges when they appeared online at 1st of January both highlighters and the blush mainly for collective reasons since I don't reach regularly for the Dior blush formula! The quints I didn't like how similar the shades look in the pan especially in Blue Garden but I would like to check in person ! So here is the Koh near dupe I have, Leaf. More yellow really. Oh lovely! It looks like the finish is more pearl than cream, am I seeing it right? Yes, you are. China Glaze Electric Pineapple is the exact same shade but more of a straight cream. I call these Peridot shades and would wear the CG on the toes and the Koh on the fingertips. Still am tempted by the Dior because it's a touch more pastel. But am saving up for the upcoming Spring Suqqu palette. It's definitely the cool one.